You may already know about Ramseyer Hall being University High School. 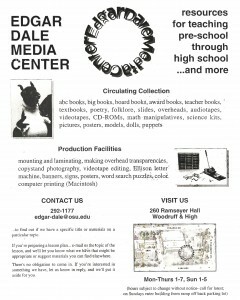 Did you know this space was also home to the Edgar Dale Media Center? The College Commons used to function as the Edgar Dale Media Center. At the time, the center was know for its circulating collection of big books, award books, textbooks, overheads, CD-ROMS, science kits, posters, and even puppets! The center also operated as an production facility that specialized in overhead transparencies, videotape editing, Ellison letter machines, and early computer printing. 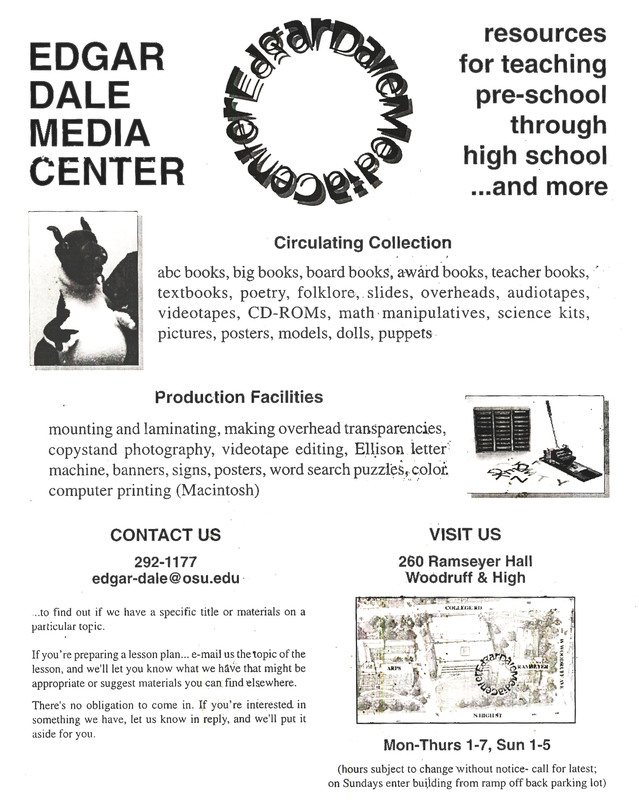 A distinguished Ohio State Professor, Dr. Edgar Dale was a schoolteacher, professor and employee for Kodak. Dale was fond of the motion picture industry for the potential impacts on student learning. After his stint at Kodak, Dale achieved major success at Ohio State. His breakthrough teaching moment was with the Cone of Experience. The Cone of Experience is a theory on how well users retain memory of various multimedia elements. Today, Instructional Designers and scholars continue to build upon his teaching methods. So when you stop by the College Commons you are paying homage to the man himself, Edgar Dale! Posted by Andrew Vogel at 4:18pm December 1, 2016 Bookmark the permalink. Play Pokémon GO in the College Commons! Andrew Vogel on Play Pokémon GO in the College Commons! neeb.2 on We just watched an educational video! Are you sure? I was so entertained!